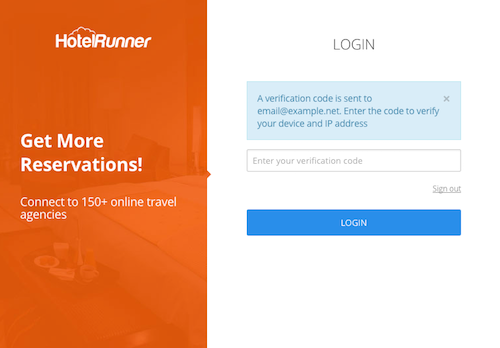 HotelRunner sends you a verification code when you sign into your account from an unfamiliar device and IP. On the sign in page, we want to check your email account to verify your sign-in attempt. Go to your email address registered to your HotelRunner account. Find the HotelRunner message titled “HotelRunner verification code”. Find the verification code within the message. Type in the code on the sign in page and click Submit.